Thyroid and iodine are highly interconnected as iodine is a essential part of the thyroid hormones, T4 and T3. About 75% of iodine in the body is used by the thyroid. Because iodine is not produced by the body, insufficient iodine results in an insufficient hormone production. When the body’s tissues do not receive the required thyroid hormones symptoms of hypothyroidism start to appear. In contrast, when an overcompensation of iodine occurs, this inadequate response results in hyperthyroidism. More from our blogs: Thyroid and You – how thyroid impacts everyone | Thyroid and Pregnancy – how thyroid impacts pregnancy | All About Thyroid – brief summary of thyroid disorder, deficiency symptoms, and more | At Home Thyroid Test – a test that measures TSH, free T4, free T3, and TPO. What is the role of iodine in thyroid deficiency? The thyroid hormones work through very specific receptors in the cells. They selectively regulate how certain genes express themselves in key tissues and organs in the body, for example in liver, pituitary gland, muscles, and development of a child’s brain. When there is an insufficient supply of iodine, it results in an insufficient production of thyroid hormones. This hormone deficiency starts to appear as visible health problems, e.g., goiter showing an enlarged thyroid gland and swollen appearance of the neck. Other well known conditions include hypothyroidism, mental retardation in newborns, reproductive impairment, and a decreased rate of child survival during pregnancy. To counteract low hormone levels, the thyroid enlarges to produce more. If the iodine deficiency is mild, this may be enough to maintain healthy levels. The thyroid stays visibly enlarged with potential risks of neck compression. Eventually, this may cause hyper-functioning autonomous nodules that can cause hyperthyroidism in future. If the thyroid can’t produce enough hormone, it results into hypothyroidism with its well known symptoms. How much iodine one consumes also influences the type and incidence of thyroid cancer. In places that corrected previously well-known iodine deficiency (e.g. in Argentina and Austria), the rate of papillary thyroid cancer increased, whereas that of follicular cancer decreased (Harach 1985). Research suggests iodine may have effects independent of the thyroid. For example, studies indicate (Ghent 1993) that fibrocystic breast disease is very sensitive to iodine nutrition and improvement has been observed when supplemented with iodine (as unbound I2 molecule rather than iodide complex). What are the symptoms of low or excess iodine? Although not so prevalent in developed countries, goiter is the most visible sign of iodine deficiency. It is the first step in a series of events that follow during iodine deficiency. Hypothyroidism—a lack of adequate production of thyroid hormones, primarily from iodine deficiency—can result in fatigue, lethargy, cold intolerance, slowed speech and intellectual function, slowed reflexes, hair loss, dry skin, weight gain, and constipation. Almost one-third of the world’s population lives in areas that are iodine deficient and deal with these consequences. Although most of these people are in developing countries, many in the large industrialized countries of Europe are also affected. In US, iodine deficiency receives little attention because it is widely assumed to be eliminated years ago. How is iodine measured in the body? About 90% iodine is eventually excreted in the urine. The urinary iodine values directly reflect dietary iodine intake; therefore, urinary iodine (or UI) analysis is the recommended and most common method for assessing iodine status for public health. It’s a quick and accurate method to quantify iodine content in population. Based on large data collected for the general U.S. population (in 2005-2006 and 2007–2008), the median UI concentrations were found to be 164 um (microgram per liter). The range for this data was 154 to 173 ug/L with 95% confidence intervals or 2-standard deviations (Caldwell 2011). What are the recommended levels of iodine? Most people can be exposed to large amounts without apparent problems (Braverman 1994) except those with preexisting iodine deficiency, autoimmune thyroid disease, and papillary cancer. As majority of the excess iodine is excreted most people can tolerate fairly large amounts without experiencing problems. Intakes up to 1 mg iodine per day are safe for most people, and much higher amounts are usually tolerated without problem. However, the upper limit for safe iodine intake is not well studied and can vary widely from person-to-person, and even by population. One group that may have problems with excess iodine is any community that has recently corrected iodine deficiency in a short period of time. An iodine-induced hyperthyroidism is a predictable consequence of such a recent change (Stanbury 1998). The main victims of such a change are the elderly who have autonomous thyroid nodules because they are unable to regulate this newly available iodine properly. They tend to produce excessive thyroid hormone and the problem is further worsened due to poor monitoring of salt iodine concentration. Then, without an adequate medical attention, diagnosis and treatment are delayed which compounds the problem. How much iodine is in the salt? About 50%-60% of the U.S. population uses iodized table salt today, a process that started in the late 1930s. Globally, an estimated 70% of the world’s edible salt is iodized. In recent years, highly publicized health campaigns in many developing countries, including India and China, have successfully lowered thyroid disorders, in particular during pregnancy. Efforts to make salt iodization compulsory have not been very successful, and its use has remained voluntary in many countries including United States. But salt iodization is mandatory in Canada despite sharing similar history of iodine deficiency as US. In both Canada and US, salt is iodized with potassium iodide (KI). The required level is 100 ppm of KI, which amounts to approximately 77 microgram iodine/g salt. Most grocery stores stock both iodized and non-iodized salt side by side and sell at the same price. But consumers are only dimly aware of the difference. Which foods are high in iodine? Only a small percentage of salt in US comes from table salt. Almost 70% of dietary salt is derived from processed foods, which mostly use non-iodized salt (Dasgupta 2008). Americans obtain iodine from many sources although dairy and grain products remain the primary sources of iodine in the American diet (Murray 2008). Iodine supplements improve the health and productivity of domestic animals—for the same reasons it benefits people—it is a common ingredient of animal feeds. Therefore, dairy products, eggs, and meat frequently contain high levels of iodine depending on the content in animal feeds. However, none are monitored as part of the American diet. About 60 year ago, iodate was introduced in the commercial baking industry as a bread stabilizer. It significantly increased the iodine intake of the American population. However, this practice has recently declined. A common food coloring called erythrosine contains large amounts of iodine. Most of it may not be bioavailable—unusable by the body—but it appears in most analyses of urinary iodine affecting the results. Many multivitamin supplements contain up to 150 ug of iodine per tablet. 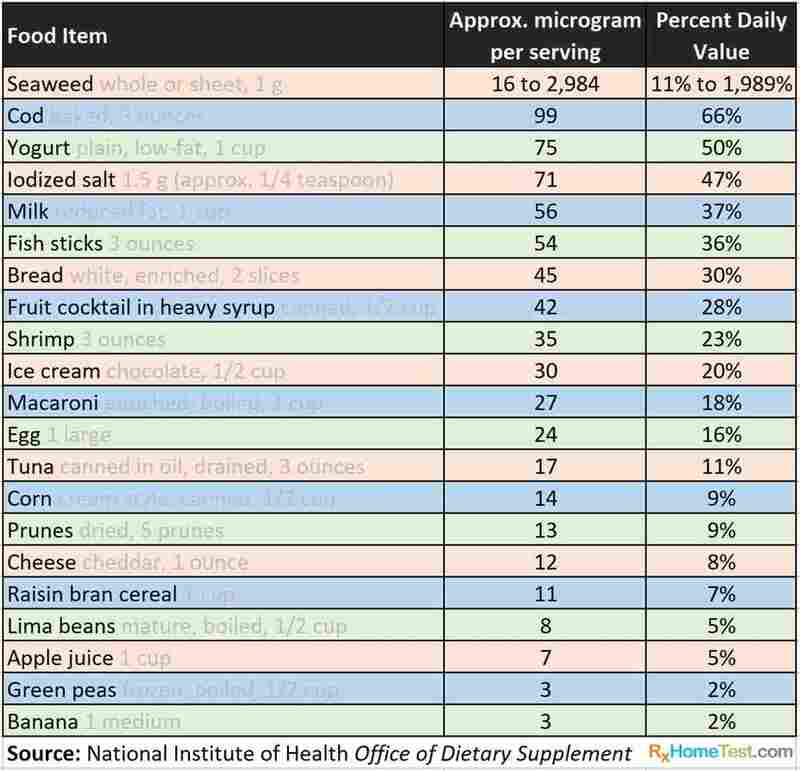 Some people consume extra iodine from kelp or other so-called health foods. Most of these are unrecognized and none are regulated, except for iodized salt. Also, changes in iodine content of these products usually occur without any public notification or awareness. Iodine is also widely used as a radiocontrast medium, in medicines such as amiodarone and topical antiseptics, and for water purification. What is the role of iodine in pregnancy? The damage is significant when iodine deficiency causes hypothyroidism during pregnancy or early life in children. That’s because thyroid hormone is essential for proper development of the central nervous system, particularly its myelination (process of neuron sheath formation). The health risk from mother’s iodine deficiency to a baby is highest during ﬁrst trimester. That’s because the fetus relies upon maternal iodine for thyroid hormone synthesis until week 18. Research has shown that a mother’s urinary iodine concentration of 50 microgram per liter or less during the ﬁrst half of pregnancy can cause thyroid problems such as enlarged thyroid gland and high TSH and thyroglobulin concentrations in the newborn (Glinoer 1995; Pederson 1993). Children with mothers who were hypothyroid at this critical period frequently show permanent mental retardation. This cannot be corrected later by using iodine or thyroid hormone. Iodine deficiency also threatens child survival. Several studies show that when deficiency is corrected neo-natal mortality may reduce 50% or more (DeLong 97). Supplementing iodine during pregnancy can reduce the risk of post-partum goiter caused by iodine deﬁciency during pregnancy and lactation (Glinoer 1992; Antonangeli 2002). Research shows iodine supplementation before pregnancy, compared with iodine supplementation during pregnancy, appears to reduce the risk of for abnormal thyroid function that results in low free T4 and elevated TSH (Moleti 2008). In US, data for women of childbearing age (approximately 14 – 49 years) show the median urinary iodine concentration to be around 130 microgram/liter. The increased awareness of thyroid impact on pregnancy has in general helped women maintain healthy levels. However, the prevalence of a UI concentration below 50ug/L remains around 15%. The National Health and Nutrition Examination Survey data (for 2005-2006 and 2007-2008) show that except for extremely low UI concentrations, overall iodine levels among pregnant women are comparable to non-pregnant women. For pregnant women, the Food and Nutrition Board of the Institute of Medicine recommends an iodine intake of 220ug (per-person-per-day; based on data from US Institute of Medicine Panel on Micronutrients DRI: dietary reference intakes 2001). This dietary dose is approximately equivalent of a UI concentration of 150ug/L. Almost all women of childbearing age with potentially low iodine intake can benefit from iodine supplementation. That’s because they may be unaware that they are in the early stages of pregnancy—a time when iodine sufficiency is extremely important. The risk of thyroid related problems in newborns can be proactively reduced by avoiding maternal thyroid issues due to iodine deficiency (Becker 2006). How to check for iodine and thyroid deficiency? Urinary iodine concentration is common method to testing iodine levels in large population. However, individuals should check their thyroid deficiency using a blood sample. The key markers to monitor is TSH (thyroid stimulating hormone). 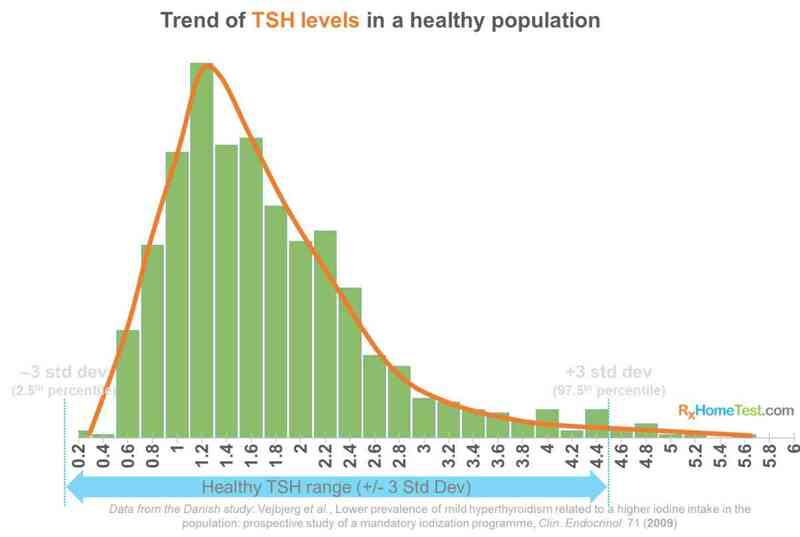 However, normal TSH levels may not necessarily mean a healthy thyroid. Checking the T4 (thyroxine) and T3 levels gives a full picture of the Hypothalamus-Pituitary-Thyroid axis. Additionally, the presence of TPO anti-bodies should be checked for potential threat to the thyroid from auto-immune diseases. Because thyroid hormone levels fluctuate significantly during pregnancy, regular urinary and blood sample checkup in childbearing women is very useful. As the baby relies on mother’s thyroid levels, checking free T4 during pregnancy ensure healthy child development and normal pregnancy. Is thyroid testing covered by Medicare? Elderly population is at higher risk of thyroid disorders and should be regularly monitored. Under Medicare coverage, a patient may test for thyroid dysfunction if their doctor recognizes a broad range of symptoms associated with thyroid dysfunction. The National Academy of Medicine recognizes treatment will benefit patients who present with significant symptoms or complications. In cases with history of any kind of thyroid disease or exposure to known thyrotoxic chemicals are covered by Medicare. Testing is crucial because thyroid dysfunction is a known cause or aggravating factor for many conditions such as atrial fibrillation, diabetes, hypertension, or hyperlipidemia. Once tested, available treatments can improve biochemical and physiological symptoms of thyroid dysfunction. However, more research is needed to understand how much treatment benefits in terms of improved survival, function, or quality of life.